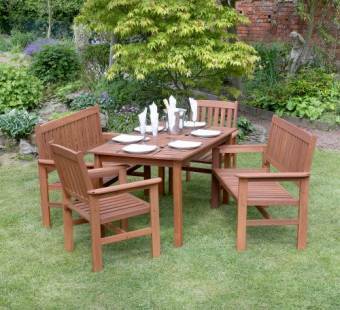 The Tropicana 5 piece hardwood garden furniture set includes 2 x 2 seater benches and armchairs. It also includes a high quality matching rectangular table that measures 140cm x 80cm (L x W). The entire set is weather treated and comes complete with brass fittings. Self assembly is required. This high quality wooden furniture set will add a touch of class to your outdoor space. Manufactured to the highest standard, this set will last you many years with very minimal upkeep.